That’s a question that we ask when a local road crew accidently slices through our Comcast cable, and we come from work to find (horrors!) that we have no cable TV or email. And indeed, it’s the question that author Andrew Blum asked when a Luddite squirrel chewed through his cable. At first glance the question doesn’t seem especially meaningful or interesting—like asking “Where is electricity?”—yet it is anything but. Much like electricity, water, or any of the infrastructures of the industrial age, the Internet does have a physical presence, diverse in character, simultaneously robust and vulnerable, and concentrated into a surprisingly small number of nexuses. Andrew Blum is a correspondent for Wired—the grandfather of digital age magazines—and is thus himself very much wired, physically and philosophically, to the Net. His errant squirrel sends him on a quest to visit and get a sense of the physical presence of the Internet, to get a tangible understanding of the huge disk farms, the power-gulping data centers, the vast ranks of routers and glowing fiber nervous systems that lie behind every email we open and every Facebook status that we post. There’s a lot of it out there, surprisingly easy to overlook. And much like the electrical backbone that powers the nation and sits nearly invisibly behind every wall outlet, there is a huge and growing physical industry behind it. Yet at the same time, also like electricity, the Internet has become so integrated into our daily life that is has nearly receded altogether from our conscious awareness: we no more think about routers and data centers when we are Googling a taco recipe then we think about step-down transformers when we throw a light switch to enter a dark room. But Mr. Blum does think about it, and wants to culture a physical awareness of our digital selves. And so he becomes our digital Virgil, guiding us through dimly lit caverns of server racks, and illuminating the history not only of the Internet as a whole, but of the individual routing centers and the companies that own or lease them. Why is this important? Because we depend on them, and because the companies behind them have varying philosophies about infrastructure and openness whose execution have real effects upon our lives. In some cases these are dictated by the laws of physics. Data centers need power and cool air, and staggering amounts of both—a large data center gulps the wattage of a small city, and throws off a concomitant amount of heat—and so it is no coincidence that Google, Microsoft, and Facebook all have a huge physical presence in central Oregon, home of the extensive Bonneville Power Authority as well as an unlimited natural bounty of cold dry air. But each company creates and manages its infrastructure in a way that seemingly mirrors its digital face to the outside world: in preparation for construction of a huge data center, Facebook announces its intentions with fanfare, trumpeting to the scattered, thinly-populated nearby towns that “Facebook is coming!” . . . while Google sends silent scouts under cover of shell corporations, masking its intentions and very identity until the last possible moment, then shielding its data centers from prying reportorial eyes behind layers of closemouthed engineers and anodyne-spewing corporate flacks. The Internet’s communications on-ramps show a similar range of character, from leased routing centers architected to resemble the sets of science fiction movies—somewhat unnecessarily, but the better to convey a sense of security and cutting-edge technology to potential customers—to lonely beachside huts on the western coast of England, where transatlantic fiber optic cables come ashore to connect with the Continent, silently launching terabits of data on its way, every second. Mr. Blum visits them all, or at least one of every type of installation, it seems, as he tries to imbue a sense of place to the Internet itself, and to convey that sense to our intuition. Mr. Blum succeeds, sometimes through sheer persistence—after a description of yet another routing center, I confess to occasionally feeling that I had been here before—and sometimes through an earnest style that is occasionally a tad too self-aware but never ponderous. But these are nits. The important thing is that the Internet, if not exactly a place, is a real, physical thing whose operation involves places and people and ways of thinking. 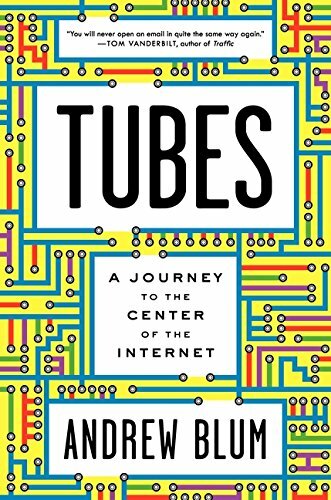 Mr. Blum paints a vivid picture of the Internet, and gives a sense that it is more than just the mysterious interstitial digital space between your computer and mine. It is, increasingly, the backbone that supports our daily life, and Mr. Blum is an able anatomist. Dr. Richard Isaacman is Vice President of Science and Engineering of ADNET Systems, Inc.